Retailers, confectionery firms and convenience stores sell up to 10 times as many sweets in February and March than other periods, as Korea celebrates Valentine’s Day in February and White Day in March, but they have faced growing complaints of excessive packaging and low-quality products. “When I unwrapped the Valentine’s Day chocolate basket, I felt fooled because the basket was mostly filled with chocolates from lesser-known brands except two to three, although it looked like it was filled with imported chocolate products,” said 29-year-old Kim Na-yeon, adding that one basket of chocolate cost about 20,000 to 50,000 won ($17.80-$44.50). Some consumers have raised a point that convenience stores seem to push chocolate products with shorter imminent shelf lives -- less than six months -- for Valentine’s Day promotions because chocolates sell well during Valentine’s Day promotions. But an industry insider responded that it is impossible for a store to pick products with imminent expiration dates and sell them during special promotions. Experts called for consumers’ attention, as Valentine’s Day could lead to excessive spending induced by marketing. 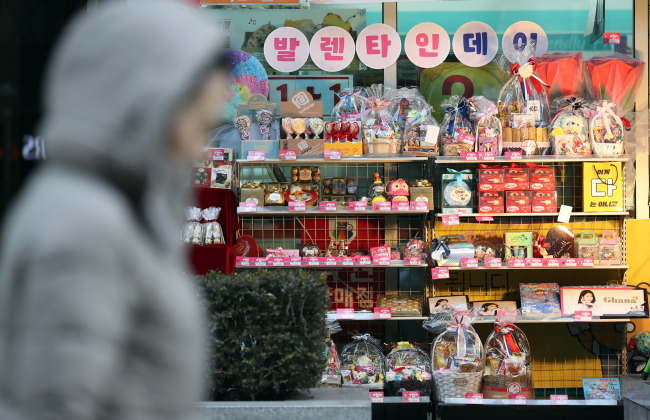 “Although such special promotions from confectionery firms can vitalize the market, it is also true that many consumers feel tricked by the confectionery companies’ commercially created celebrations and events,” said an official from the Korea Consumer Agency.